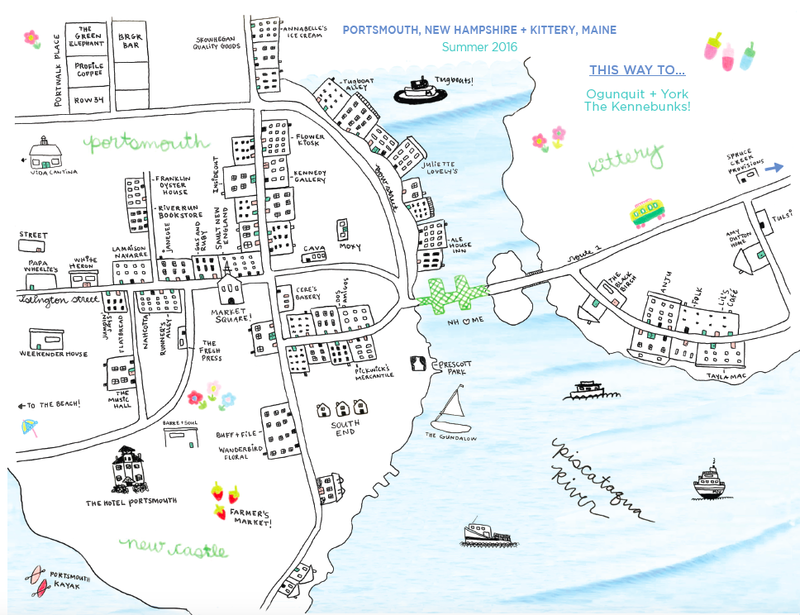 LOCAL FEATURE: Seacoast Lately’s “It Guide” – Summer, 2016! Hooray! Summer is here! This means many tourists are flocking to the seacoast for weekend trips, family vacations, day trips, or for us locals, a summer-long staycation! To show visitors the ‘best of the best’ when it comes to exploring the seacoast, we created a curated guide for discerning tourists who might also enjoy a local inside scoop! 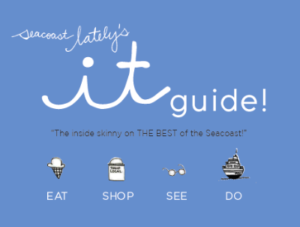 Seacoast Lately’s “It Guides” will be out and about this week at participating shops, restaurants, and hotels in Portsmouth and Kittery, so if it tickles your fancy, pop by and pick one up! All of the participating businesses selected three words that they felt best describe their business…it’s fun to see what everyone chose! 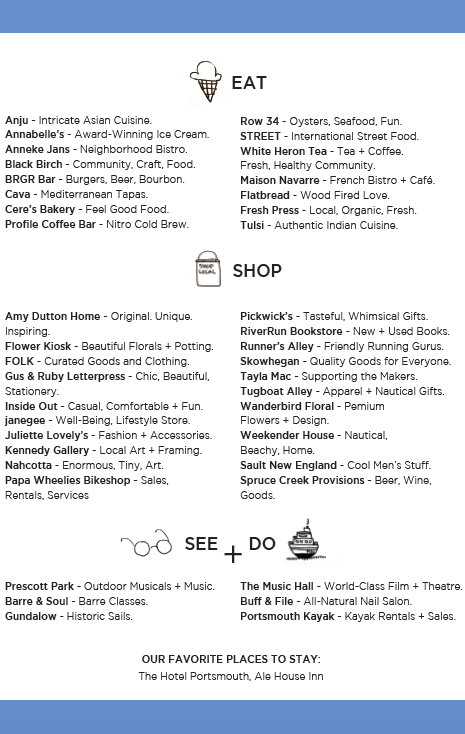 Thank you to all of these selected local businesses for participating in this summer’s “It Guide”! Anju – Free-Style Asian Cusine. Annabelle’s – Award-Winning Ice Cream. Black Birch – Community, Craft, Food. BRGR Bar – Burgers, Beer, Bourbon. Cere’s Bakery – Feel Good Food. Dos Amigos – Healthy, Fresh, Mexican. Flatbread – Wood Fired Love. Franklin Oyster House – Neighborhood Oyster Bar. Fresh Press – Local, Organic, Fresh. Green Elephant – Vegetarian Bistro + Bar. Jumpin’ Jays Fish Cafe – Fresh, Local Seafood. Maison Navarre – French Bistro + Café. Moxy – Modern American Tapas. Profile Coffee Bar – Nitro Cold Brew. Row 34 – Oysters, Seafood, Beer. STREET – International Street Food. Vida Cantina – Local, Modern, Mexican. White Heron Tea – Tea + Coffee Community. Amy Dutton Home – Original. Unique. Inspiring. Flower Kiosk – Flowers, Gifts, Events. FOLK – Curated Goods and Clothing. Gus & Ruby – Chic, Beautiful Stationery. Inside Out – Casual, Comfortable + Fun. janegee – Well-Being, Lifestyle Store. Juliette Lovely’s – Fashion + Accessories. Kennedy Gallery – Local Art + Framing. Nahcotta – Enormous, Tiny, Art. Pickwick’s Mercantile – Whimsical, Wondrous Experiences. RiverRun Bookstore – New + Used Books. Runner’s Alley – Friendly Running Gurus. Sault New England – Cool Men’s Stuff. Skowhegan – Quality Goods for Everyone. Spruce Creek Provisions – Beer, Wine, Goods. Tayla Mac Boutique – Supporting the Makers. Tugboat Alley – Apparel + Nautical Gifts. Wanderbird Floral -Premium Flowers + Design. Weekender House – Comfortable, Coastal Home. Prescott Park – Outdoor Musicals + Music. Barre & Soul – Community, Strength, Barre. Gundalow – Sail the Piscataqua. The Music Hall – World-Class Film + Theatre. Buff & File – Modern, Healthy, Mani-Pedi’s. Papa Wheelies Bike Shop – Sales, Rentals, Service. Portsmouth Kayak – Kayak Rentals + Sales. The Hotel Portsmouth – Historic Boutique Hotel. Ale House Inn – Inn on the Piscataqua! Thank you for reading and happy summer!